Well, we made it. It's 2019. 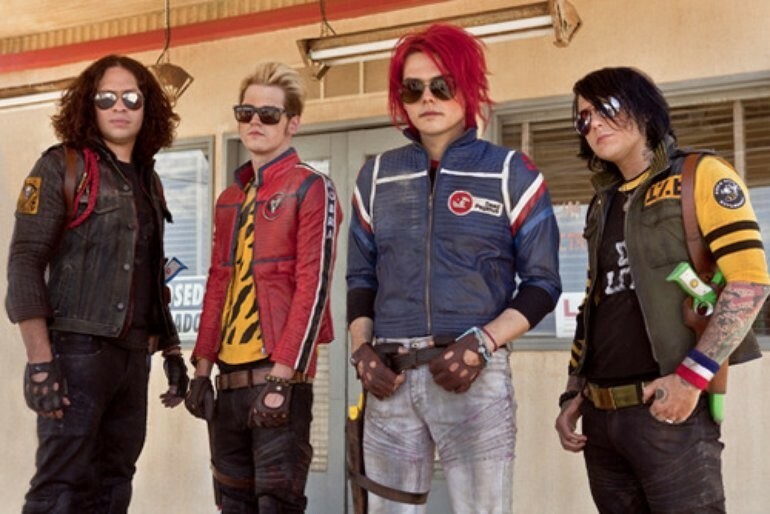 The year that My Chemical Romance's 2010 album 'Danger Days - The True Lives Of The Fabulous Killjoys' is set in. While My Chem were promoting 'Danger Days', they released a series of promo videos to help shape the narrative and concept around the album, all set in 2019. Fortunately for all of us, all of those videos are still on the internet for us to revisit. Now that we're living in the age of 'Danger Days', it seemed only appropriate that we revisit Battery City and check out what My Chemical Romance imagined 2019 would look like. And sure, it's dramatic hyperbole for effect, and it's a crafted narrative in a nonexistent city from the mind of Gerard Way, but... well, just take a look. We kick off proceedings with a news broadcast from Fact News: The Only News. The BL/ind megacorporation-sponsored news dissemination agency. No Fake News here! Only Fact News! The news broadcast shares that the government will be releasing billions of artificial flies into the atmosphere as a part of the International Surveilance Initiative. As the flies look just like regular flies, citizens are urged not to smash insects moving forward, as you may be destroying government property- an offence punishable with a half million dollar fine, or 30 years in prison. But that's not all! No, sir! Are you tired of having feelings? Because the de facto political and commercial force BL/ind have a pill for that. "Get rid of those counterproductive emotions of depression, anger and anxiety. BL/ind branded medication makes life better. Talk to your doctor today and eliminate all of your problems." Sound anything like those commercials for pharmaceuticals that are on television? Curious. Nothing weird about a commercial-political thought adjustement video. Nothing weird about that at all. Maintaining conformity through thought-control advertisements. And we circle back around to another broadcast from Fact News: The Only News. This time, the weather in Battery City is somewhat... catastrophic. It's almost as if global warming has reached a point where we now only have 12 years to limit the catastrophic effects of climate change. Almost as if this weather forecast was prophetic. Of course, we aren't trying to say that My Chemical Romance were out here trying to predict what 2019 would look like when they released their last studio album. Just taking a fun look back at the promo materials they used on their 'Danger Days' album cycle. But welcome to California 2019. This year is 'Danger Days' territory. So it's time to hit the red-line and up thrust the volume out there- keep your boots tight, keep your gun close, and die with your mask on if you've got to. Or some other equally relevant lyric from 'Danger Days'.